Flu season has officially begun! Experts believe that this year’s flu season may be more active and severe than last year’s. 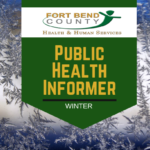 Fort Bend County residents are encouraged to get their flu vaccination and help us stop the spread of flu viruses in the county. Influenza (the flu) is a contagious respiratory illness caused by influenza viruses. It can cause mild to severe illness, and at times can lead to death. Some people, such as older people, young children, and people with certain health conditions, are at high risk for serious flu complications. While flu activity does vary from season to season, peak activity typically occurs between October and May. The dominant strain of the flu this season appears to be H3N2, which is known to cause more severe illness. Unfortunately, health experts believe that this year’s flu vaccine may not be as effective as previous years against H3N2. However, the flu vaccine may protect against other flu strains and it may help reduce the severity of illness for vaccinated people. Cough or sneeze in your sleeve or cover your nose and mouth with a tissue. Throw the tissue in the trash after you use it. Wash your hands often with soap and water. If soap and water are not available, use an alcohol based hand sanitizer. Avoid touching your eyes, nose and mouth. Germs get into your body this way. If you get the flu, antiviral drugs can help reduce severity of symptoms. Be sure to finish all the medication your physician prescribes. Stay home if you are ill!